DEBUTS AT #4 ON THE iTUNES ROCK CHART! 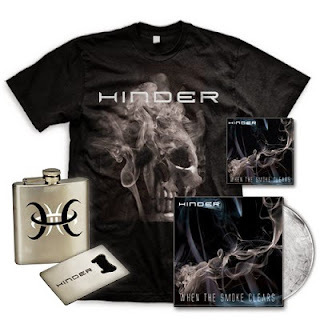 NEW YORK, NY (May 12, 2015) – Anthemic, multi-platinum rockers Hinder have just released their fifth studio album, When The Smoke Clears, via The End Records/ADA. When The Smoke Clears is available on digital, CD and LP formats, and in multiple album bundle configurations. With over a decade-long career under their belts, and having honed their chops touring with the likes of Mötley Crüe, Nickelback, Aerosmith and Papa Roach, When The Smoke Clears, the debut release with Hinder's new lead vocalist Marshal Dutton, has breathed new sound, and new air, into the ever-evolving band. 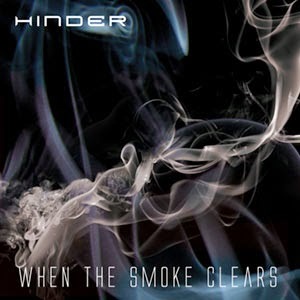 The songs on When the Smoke Clears run the gamut from rowdy rock to subtle country influence, to memorable pop hooks, all of which retain the DNA-distinct spirit of Hinder. That ability to walk the tightrope between genres, without a net, is something the band has had fun with in creating the new album. AVAILABLE NOW ON iTUNES & AMAZON! The official lyric video for 'Intoxicated' just premiered on Loudwire! Multi-platinum rockers Hinder, whom have sold over 3.8 million albums and more than 7.5 million singles, garnered north of 130 million video views, and racked in 40 million spins on Spotify, and counting, are back with their fifth full-length album When The Smoke Clears. 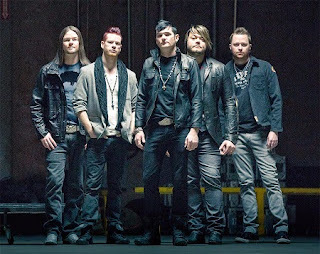 As one of the few bands to have massive cross-over success in recent years, Hinder’s debut album Extreme Behavior climbed to #1 on Billboard’s Top Heatseekers chart and made its way to #6 on The Billboard 200 chart. The album featured one of the biggest songs of the year, ‘Lips of an Angel’ - a Top 5 hit across EIGHT Billboard singles charts (including #1 on Top 40). Their sophomore effort, Take It To The Limit surpassed their debut, peaking at #4 on The Billboard 200, solidifying Hinder as the biggest new breakout rock act and catapulting them into packed arenas worldwide with their explosive live show. Proving they consistently make hit records, the band followed the first two albums up with a #1 Top Modern Rock/Alternative Album (All American Nightmare), and a #3 Top Hard Rock Album (Welcome To The Freakshow). With increasing social media stats (1.6 million Facebook followers), it’s clear that Hinder fans are along for the ride and as hungry as ever for more.